The Book Chook believes the very best way for a child to learn to read is to be talked to, sung to, and read aloud to from the moment she's born. I also believe there's a danger in spending too much of our time glued to some kind of screen. In the 21st century it's vitally important to find a balance for ourselves and our kids. We need to spend some time with screens, but to spend the most time interacting with other people and our environment - flying kites, sharing stories, dancing by the ocean, and hugging those we love. However, when it is screen time, it makes good sense to find something kids will both enjoy and gain benefit from. If you think your youngster would like to visit virtual worlds like Adventureland and Storyland, play games with rhyming, follow along with stories and songs, race a buggy, go hang gliding, create works of art and more, may I suggest you check out JumpStart? One look at the JumpStart site and you can tell it's bright, colourful and entertaining. But does it teach anything? Yes, JumpStart teaches, in that it provides hundreds of opportunities for learning to take place. There are so many problem solving, critical thinking, creative, math and literacy activities, all bundled up in a coating of motivation and fun. One of the many things I liked about JumpStart, was the fact that it has different levels of difficulty (admittedly, I never made it off "easy"), and a huge range of activities. It seems the designers are going to keep adding to the worlds, providing more value for a child's online experience. JumpStart also forgives. I gave it the Book Chook works. I goofed off, changed my mind, got impatient, didn't follow instructions. For the most part, JumpStart was patient with me, repeating directions, encouraging me to try again, providing navigation, help and chances to go over things. (I did manage to freeze the game once or twice, but that may have been a browser glitch.) 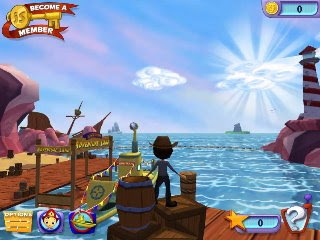 Like all online games, JumpStart has loading times, and kids will need to be patient for several seconds while each new stage of the game loads. Another plus in my eyes, was that the songs in JumpStart are actually ones an adult can bear to listen to over and over again. I loved the cute little Jukebox - "ABC Harmony" had my wings flapping and toes tapping immediately. There are activities to practise letter and sound recognition, books to read along with, movies to watch and sing along with, cars to race around on, gold to grab, puzzles to solve - the list goes on and on. I entered the JumpStart virtual world four times for hours at a stretch, yet I know there was so much that I didn't get to experience. The JumpStart blog is also a fascinating place. Artists who developed JumpStart show behind-the-scenes glimpses of their creation process. There are craft and snack suggestions, ideas for science activities, tips for making spelling fun, and many more. I believe that JumpStart - used in conjunction with a parental philosophy of reading aloud from children's literature, talking and listening, playing, creating and pretending - makes a great choice for screen time. I'd recommend it for children as young as 3-4, with parental guidance. If your three-year-old wants to play video games, better for him to play something specifically designed with his needs in mind, than something inappropriate. I can see 8 or 9-year-olds jockeying for position at the keyboard to try out the games. Book Chook Special Offer: If you take advantage of JumpStart's free one month trial, you'll certainly find activities to satisfy the whole family. Better still, leave a comment here AND send me an email to let me know you and your kids would be interested, and I'll enter you in the draw to win a FREE THREE month's membership, courtesy of the friendly people from Knowledge Adventure/JumpStart. I certainly agree that online resources can be used to supplement reading and real world experiences. It is so important to provide our children with a variety of experiences and activities, but it is not easy when we are so busy! There are so many resources available these days, so how do you know which ones are worth your time and money? It's great to be able to find a recommendation from someone you can trust. In this case, I am not familiar with JumpStart's web site, but I know it must have a lot to offer because Book Chook would not have recommended it otherwise. She makes it easy to make informed choices. Thank you for another great recommendation, Book Chook! We recently moved our old computer into the kitchen so that our daughter would a) use it more and b) let us supervise her online activities. When she was little Genna and I played computer games together like Blues Clues and Reader Rabbit. She hasn't used it much lately. Maybe this game will be the one to get her interested again. We'll give it a try. Thanks for finding it! Great idea to have the computer in the midst of all the family action, Kim. I am glad I stumbled across your blog. I wanted to invite you to a message board for moms. Thanks for the invite, Chatterscene. I'll check it out. My kids love JumpStart. We have since paid for a 1 month membership (and won a year membership) since doing the free trial. My 4 yr old especially loves it and has already completed the 4-6 lvl and is playing the 5-7 lvl now. It's amazing how it is helping to cement all the learning he has been doing - this boy LOVES to learn and at 4 is already reading and doing a lot of math. I think JumpStart really helped to reinforce his reading skills and has him already doing quite hard math for a 4 yr old. Thanks for the feedback, CourtneyB. I guess little ones will often want to be in on an activity an older sibling is engrossed in. But it's good she has fun on her own level. Oh, we're interested. My kids are five and almost four so I think it would be perfect for them! I'll send you an email now. Corey, a random chicken chose your name! You've just won three month's free membership to JumpStart!